A little girl and an extraordinary teddy bear share the secrets of a wondrous, sometimes puzzling world in this charming children's tale that celebrates diversity, from the acclaimed author of the schoolroom classic To Sir, With LoveLisbeth has a new best friend, her toy bear, Billingsly, who has one perfectly formed ear that is ideal for hearing what goes on in the world around him. But with his left ear, which is misshapen, he listens to Lisbeth alone. When she speaks into Billingsly's crinkled ear, Billingsly speaks back, though he'll talk to no one but Lisbeth because adults would never listen to him the way she does, and other children tend to shun him because he is different. When Lisbeth is in school, Billingsly enjoys adventures from his perch on the windowsill in her bedroom with animals roaming the outside world and magical creatures like the Tooth Fairy and the other bear in the mirror. 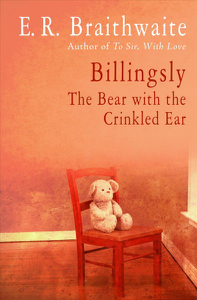 But his greatest adventures take place when he is in Lisbeth's arms, for nothing is more magical than a little girl's love.Filled with wit and wonder, Billingsly is the tale of an extraordinary friendship that is sure to enchant children of all ages, and adults who are young at heart.